I got an old Mac from a collegue at work. Apple decided not to support those devices anymore, anyway, they date back to 2006. I think, it’s a pitty, because this Mac has a solid case, a pretty fast 64-bit processor (sorry Archlinux32, no test machine for you) and a graphic chip which is not melting away like in later models (I don’t name brand names here).. I didn’t try any Sierra OS X hacks (or installing a Capitan, rumours are, it works even on such an old laptop) on old hardware and besides, Archlinux is a better choice for a developer on a Mac. Although there are still MacPorts for OS X 10.6.x (no Brew though), it can be quite painful to get something compiled on a Mac OS that old. As we will see later, we want to keep OS X around to be able to change some settings, extract some firmware, etc. We have a whooping 120 GB hard disk space, so I shrank the OS X partition to 64 GB. This can be done in the Disk Utility.app, just leave EFI in peace, set OSX to 64 GB and assign the rest of the hard disk as free space. I used ReFIT for MAC to improve the somewhat limited EFI environment of an early Mac (don’t get me wrong, it’s pretty impressive that such an old machine already had EFI, but nowadays this EFI shows its age). The firmware is a 32-bit EFI without a proper command line mode, causing trouble all along. I didn’t take ReFind as I didn’t expect the 32-bit EFI to be currently supported, especially as I see Tianocore failing to build with more modern 32-bit binutils and gcc. I installed a 32-bit GRUB onto the EFI partition as a second boot option along to OSX. This one then boots ArchLinux. This is easier than trying to load a 64-bit kernel with kernel EFI stub support from an 32-bit EFI environemnt with systemd-boot. I didn’t want to boot into legacy mode to make the VGA BIOS visible, so I got a nice problem during KMS switching during early boot: the graphical output just froze. The irony here is that modern Linux and Xorg don’t care at all about the old VGA/VESA BIOS, but they do so for KMS, where the kernel has to rely on 16-bit firmware functions in the video BIOS to program the video chip for graphics mode. [2.052705] [drm] initializing kernel modesetting (RV530 0x1002:0x71C5 0x106B:0x0080 0x00). So this basically translates to: “I don’t have a direct rendering interface, because there is no video card, because there is no BIOS for that card”. The key idea was to extract the VESA BIOS on a distribution which handles the KMS switching correctly (in my case an old Ubuntu 10). This firmware comes into /lib/firmware/radeon/vbios.bin to be available during boot. The next problem was that the radeon module in the Linux kernel doesn’t know about this firmware. There is a patch in https://bugs.freedesktop.org/show_bug.cgi?id=26891 for older kernels, but it translates easily to the latest kernel. All it does is to load the vbios.bin file from the right place, when all the other options fail. My version of the module is here, check out function radeon_read_bios_from_firmware and the code calling that function. Everything was running smoothly.. for about 10 minutes. Then my LCD display just went pitch black. Also handy is the https://aur.archlinux.org/packages/brightd/, though I think also systemd-backlight can nowadays at least save the brightness across reboots and suspends. Here we come to iSight and why we need OS X around to extract the proper firmware. https://wiki.archlinux.org/index.php/Mac#Webcam has a really nice walkthrough. Shortly, you need https://aur.archlinux.org/packages/hfsprogs/ to mount the HFS partition. There you will find a file called AppleUSBVideoSupport in /System/Library/Extensions/IOUSBFamily.kext/Contents/PlugIns/AppleUSBVideoSupport.kext/Contents/MacOS. 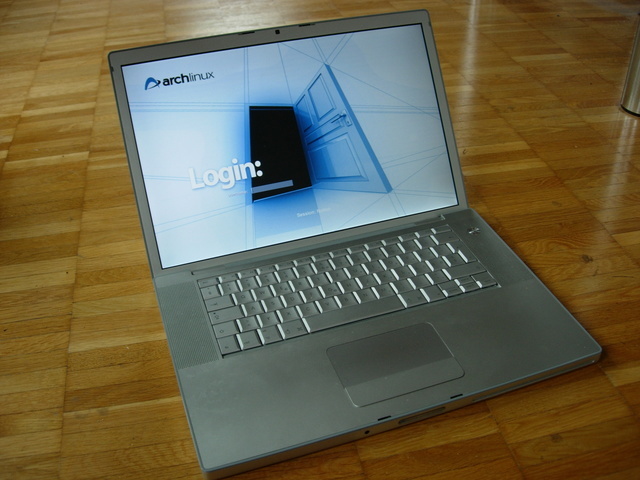 You will also need https://aur.archlinux.org/packages/isight-firmware-tools/. It contains tools to extract the file containg the firmware called isight.fw from AppleUSBVideoSupport. Finally it contains an udev rule in /etc/udev/rules.d/isight.rules which then makes sure the firmware is also loaded on startup during detection of the camera via udev. The wireless card was supported without any problems. Just some channels were not visible. Note: I think my method is deprecated and you can also specify the regulatory domain directly in wpa_supplicant.conf, but then how to use systemd-networkd with that? https://aur.archlinux.org/packages/macfanctld/ from the AUR works nicely, also lm_sensors had no problems to get the sensor data. cpupower seems to work fine. Just make sure the ‘p4-clockmod’ module is loaded at boot. Note: I didn’t try powertop or other tweaks. I got some worriesome ticking noises of the hard disk after a suspend and my battery is not that powerful anyway, so I’ll run mostly on net power. Managers might like to use only one mouse button. Also keyboard fanatics may be happy by just switching off the mousepad completly. The one button mouse is a disaster for people being used to Xorg copy- paste or Oberon enthusiasts used to three mouse buttons. Scrolling with two fingers is nice, but per default they are enabled only for up and down. I enabled also scrolling to the left and right. Besides, the keyboard is missing PageUp, PageDown keys, which is a usability nightmare when you want to scroll bigger source code files or web pages (yes, I know there is Fn-Page, but having Ctrl, Alt, Meta and Fn all on the same spot doesn’t make it easier to find the right one). Side note: I’m using Fn for keyboard scrolling (PgUp, PgDown), Ctrl for Wordstar short-cuts, “Alt” for Notion (window manager) shortcuts, and they are really CLOSE together..
TabButton1=1 only leads to all kind of frantic behaviour, because I touch the touchpad by accident too often. ClickButton and TapButton for the second and third button are just completly useless. Either no menu appears for TapButton or a menu appears for ClickFinger, but I can no longer do copy-pastes. The default modifiers Ctrl, Alt, Meta don’t do anything with the mouse or just very weird stuff, like Alt-2-fingers jumps to the beginning of my text. For now, I choose TapButtons for copy-paste, as this is the function I need most often. I might add some Ctrl, Meta modifiers to get 2, 3 mouse button clicks later. In a world where companies try hard to get people into their ecosystem (controlling what they what users can do with the products they bought and own, what they can repair or let repair, what kind of operating system and software they are supposed to use), I think, it’s the duty of any tech professional to invest some time to give old hardware back some purpose (hence I’m also working on the Archlinux32 project). Also, throwing away barely used machines, just because a company wants to earn billions, is an ecological disaster. Remember, companies have been invented to make money, don’t get fooled by “we are there to make the world a better place” or any other marketing bs. As the company which should not be named is quite good at this kind of business, I expect all major vendors to follow soon. So that’s why I keep a park of old machines around and I’m not buying new machines since 10 years (I do buy old ones from Ebay though). https://bbs.archlinux.org/viewtopic.php?id=139511: some discussions about the VESA radeon topic in the Archlinux forum.